It is daggers drawn with neighbouring Yorkshire folk and it boasts the glamorous red rose as its county flower – it can only be Lancashire! This North West county has an impressive coast (Blackpool Tower, anyone? ), a fascinating history and incredible scenery. With an excellent motorway network (the M6, M63, M65 and M55 serve the county), and with two of the North’s largest cities Manchester and Liverpool nearby, there’s bound to be lots of reasons to go glamping! 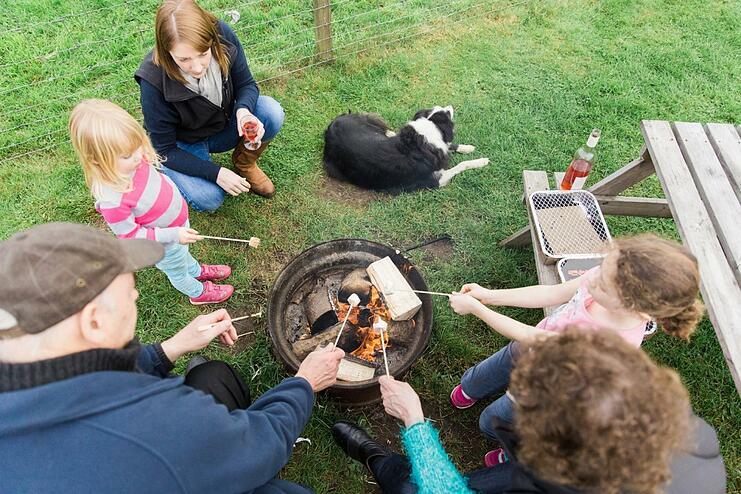 Wigwam® Holidays Ribble Valley is based near the Forest of Bowland, an Area of Outstanding Natural Beauty. As the names suggests, there are peaceful wooded areas along with a complex mix of fells, uplands, open moors, and valleys. About 13% of its land is designated as Sites of Special Scientific Interest, meaning this area is very much favoured by Mother Nature. Heading out towards the coast, there’s Morecambe, Fleetwood and of course Blackpool to name a few seaside resorts. Morecambe’s famous resident, Eric Morecambe, took his hometown’s title as his stage name and teamed up with Ernie Wise to entertain theatre and TV audiences during the 1960s, 70s and 80s. Fleetwood is a picturesque Victorian seaside resort with a stunning promenade and marina, while Blackpool needs no introduction with its iconic tower, world-famous Pleasure Beach and jaunty piers stretching into the boisterous Irish Sea. If you prefer things to be a bit more sedate, then head to Lancaster, one of England’s Historic Cities (an impressive list that also includes Salisbury, Lincoln and York). With its awesome castle, quirky shops and riverside walks discover a complex past amongst its narrow atmospheric streets. Heading back towards the Ribble Valley, this heather-clad location gets its name from the River Ribble that meanders its way across the countryside. Lancashire has a number of majestic rivers, including the Lune, the Calder and Wyre. The market town of Clitheroe is close to Ribble Valley, and is overlooked by the mysterious, mythical Pendle Hill, which has connections to the famous Pendle Witches. We can’t mention Lancashire without mentioning its links to the cotton and paper mills of the eighteenth and nineteenth centuries. The North West was thought to have been one of the wealthiest parts of the world during the Industrial Revolution. Many mills were powered by water and are found close to the county’s rivers and canals. This whistle stop tour of the land of the red rose has merely scraped the surface of this varied and remarkable county. Hopefully you’ve been inspired to visit Lancashire, and book your glamping Wigwam® Cabin at Wigwam® Holidays Ribble Valley for a memorable holiday.